We've done this cold damage thing before but one plant that was near-death deserves a separate conversation. As you know, cold damage in adeniums is more insidious than we think, sometimes. Cold, per se, is not so fatal as long as it does not drop below freezing and the plant is totally dry. But cold and wet---the very definition of spring---will kill your adeniums. Damage like this is hard to spot---the plant never shows stress and unless you examine closely and poke around under the soil, sometimes you won't know. This one, for instance, was not noticed until mid-summer. Look at that----rooting and rotting at the same time! This plant had a good-sized taproot. Brought outdoors in late March last year, by July it had lost all of it to root rot. At some point, as the weather got warmer, the plant tissue hardened and the necrosis started creeping upwards between the trunk and the skin instead. After digging it out, it was apparent this plant was torn between life and death. Despite the roots coming out of the sides, though, the rot was not done, by far. That mush there was the most worrisome since it was not stopping and was actively going up. There were other soft spots on the trunk too. If you catch it early enough, you can just slice off as much of the dead or dying tissue until you see healthy tissue. Then, hang it somewhere out of the way. You want it to be dry and shaded. So today, I unpotted this plant to see what's what. Kids, don't do this in winter unless you have a generous space on your heat mat. It will not be happy with just ambient warmth, it will need supplemental heat. So, fast-forward six months. The bottom has healed completely, losing the callous. This, too has healed nicely. And now it needs a bigger pot to grow in. Cold damage took 4 months to manifest on this specific plant. Because it was mid-July by the time it was noticed, the heat had already stopped the rot and triggered new roots to form. This means a healthy-looking plant may not necessarily be that healthy. In spring, it pays to closely examine your plants. Air dry for a month. 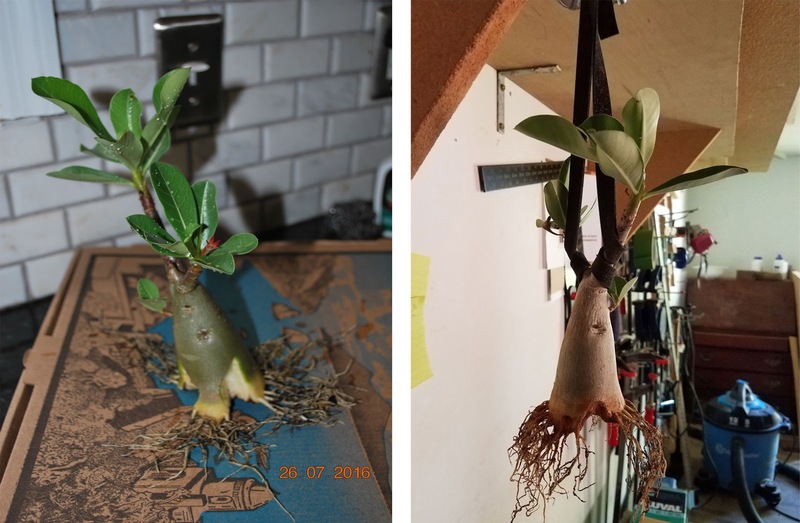 I found that the drying time between a plant already suffering from rot and a root-pruned healthy plant is different. The healthy plant heals over from the cut and bounces back in nearly half the time. It is easier to rehab a plant like this in gritty mix without soil. That way, it can be watered and therefore will not dehydrate while also letting it dry faster. A bigger plant will need longer drying time before being potted. I once had two yearlings out of the pot for about 7 months and when potted up, they just resumed growth. In other words, don't worry about having to keep them out of the pot for the amount of time it takes to form a firm and mature scar tissue or callous over the cuts you made. IN my experience, gluing things to an open cut only works well on healthy plants. Adeniums already stressed from root rot will not fare as well or fail altogether.From the other victims of my spring die-off episode, I found that plants that had to be cut above the soil line do not survive. They just take a long time to finally die. You're better off grafting pieces to a healthy plant if you want to save the stock.